Coffee can be enjoyed in their tech retail space or outside. There are 2 new coffee shops in Point Loma, so we decided to check them out at the same time. Point Loma Coffee recently changed names from Tech Outfitters to Point Loma Coffee. There was no ownership change and no product change, just a name change to better reflect the 2 products they sell: coffee and technology. Tech Outfitters will still offer tech assistance and sell tech related items. 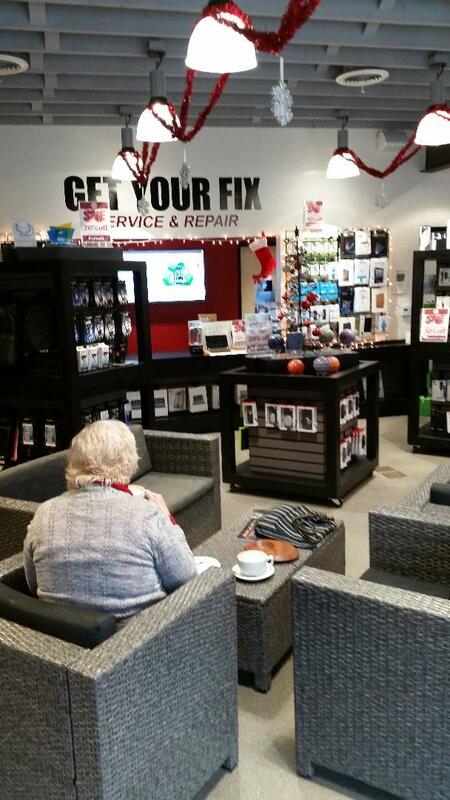 You can relax in their retail space in comfortable chairs while sipping a coffee drink from Point Loma Coffee. That’s where we enjoyed our holiday coffee fantasy, a Candy Cane Red Velvet Mocha…the best specialty coffee drink I’ve ever had! This phrase may be over used, but in this case it’s true. They only serve locally roasted coffees, but we have so many roasters in San Diego that they rotate their selection. The week we were there they had brewed OB Beans, Seven Seas, and Manzanita. Websites for their current coffees are OB Beans https://obbeans.com/, Seven Seas Roasting https://sevenseasroasting.com/, Manzanita Roasting https://manzanitaroasting.com/. Our twin cups of heavenly Red Velvet. They also have a few unique coffee options, such as their Cascara Fizz made from the dried cherries of the coffee plant topped with sparkling water. Perfect on a hot day! 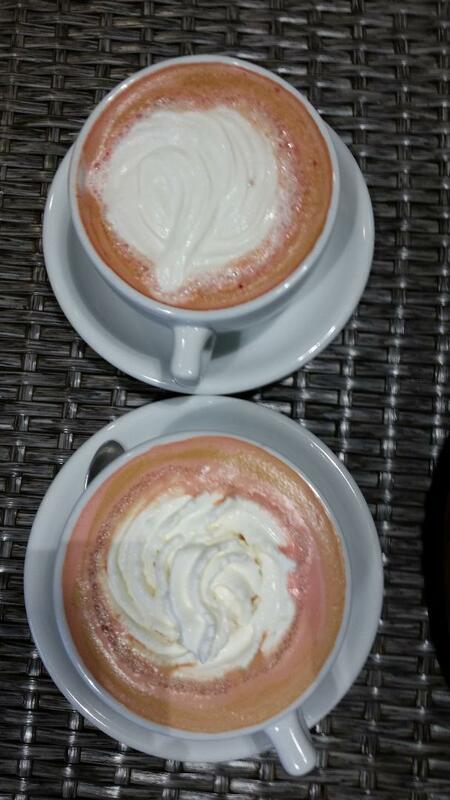 Or try their holiday beverages, such as the Candy Cane Mocha we had or a Salted Maple Latte. Parking is free & usually easy to find on Dickens St. (with a 2 hour time limit). They open at 7:00am Mon.-Fri. and at 8:00am Sat. & Sun. Closing is at 7:00pm daily except Sun. has a 2:00pm closure. Come for Happy Hour where your 2nd coffee (of equal value) is free from 2-4pm Mon.-Fri. Nearby is Portside, a coffee & gelato option next to the new Ketch Grill on Shelter Island Dr. Their coffee is locally roasted by Café Moto (www.cafemoto.com). Pastries are made in house and ice cream is made to order by an Arizona company. It’s a tiny space, but has plenty of outdoor seating. They are part of the Brigantine Group of restaurants. Look for Portside Coffee to expand when the Brigantine opens their group of restaurants along Harbor Dr. (where Anthony’s used to be). Parking is metered at the Shelter Island Dr. location and will be also be metered when their Harbor Dr. location opens. This location is open 6:00am to 9:00pm daily. 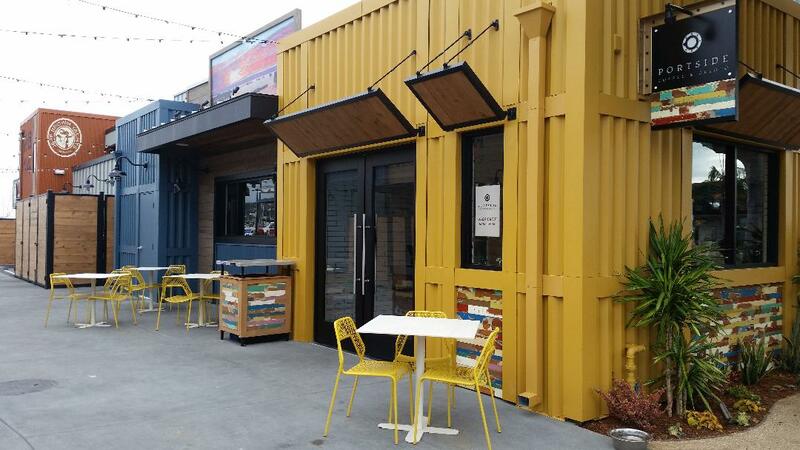 Portside Coffee is built to look like a cargo container. This entry was posted in architecture, near the beach and tagged Point Loma. Bookmark the permalink. I see where San Diego is finally getting some rain. Which coffee shop do you recommend for that rare rainy San Diego day? Call me if you’re in San Diego & we’ll meet for coffee! But to answer your rainy day question, I’d go for a cafe with a fire place like TeMana in OB (but they’re closed on Wed.). Just up the street is Run for Cover, a new independent bookstore that also serves coffee. P.